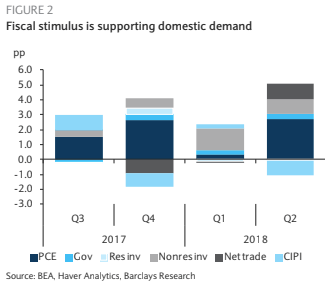 The Barclays Research Team offers their insights on what to expect from today Federal Reserve (Fed) monetary policy decision due to be announced at 1800 GMT. “We believe that the Fed is likely to read the Q2 GDP report as we do. We see participants as discounting the contribution from trade given the policy uncertainty and focusing their attention on final sales to domestic purchasers. On net, it is likely that the committee will conclude that stimulus is passing through to activity as anticipated. The August FOMC comes without a press conference or updated projections, leaving the FOMC statement as the only medium of communication. We think the main message will remain unchanged; in the face of sizeable stimulus, improving labor markets, and steadily firming inflation, further gradual rate hikes remain the most likely outcome. We expect two further 25bp rate increases this year, in September and December.